When you’re young you really want to enjoy life, right? That’s perfectly reasonable, surely? You’re fit, you’re healthy, you’re full of energy and there will never be a better time than now to enjoy yourself. If you can’t enjoy yourself when you’re young, when can you enjoy yourself? If you’re lucky enough to have lots of money then good luck to you. Live life like there’s no tomorrow. The problem is most people are not quite so lucky. Most people are constrained financially, at least to some degree. Equally for most young people, earnings are quite low when they start out on the road to independence and there are bills that can’t be avoided. Everyone needs somewhere to live. We all need food to eat. We all need heating and lighting as well. Then there are all those taxes and municipal charges that must be paid too. So for most people there’s probably not a lot left at the end of the month for discretionary spending. The temptation then is to borrow money so you can have a good time. Going into debt to fund discretionary spending is a really bad idea. So don’t be tempted. Spend money you don’t have on anything that is not absolutely essential and you will be on the road to the poor house. Some things you cannot live without. For instance if you want somewhere to live then you’ll probably have the need to buy a house. Unless you’re a millionaire, buying a house will mean a mortgage which is a form of debt. However that is good debt in the sense that you’ll be buying a home which is also likely to be an appreciating asset. So on that chances are you won’t lose. Interest rates on mortgages are low because the mortgage provider will secure the debt against the property. You fail to pay and they’ll take the property. In this case risk for them would be low, so that is reflected in the interest rates charged. Debt for discretionary spending is quite different. That will be unsecured debt and so interest rates on that debt will be very high. If the debt is on a credit card then chances are you’ll be paying in excess of 30%. If the debt is in the form of a ‘payday loan’ then interests rates can be anything from 1,000% to as much as 4,000% or even more. Even a small loan can quickly become a massive debt due to the effect of compound interest. If you’d like to take a holiday or buy a car or have a party or buy the latest electronic gizmo, then save up for it first. For items like these, you only buy once you have the money in the bank to cover the cost. Debt when it is unsecured is always very expensive and once you get sucked into a large debt hole it can be a real struggle to get out again. Debt enslaves you; it is stressful; and it will keep you awake at night. The pleasure you might get from discretionary spending can quickly turn into a nightmare if it results in debt. Getting into debt is easy; getting out again can be both difficult and painful. Don’t allow your better judgement to become clouded by your desire for a little pleasure. Everyone wants to have fun but don’t make the mistake of getting your kicks with money you don’t have. However big the temptation; you will regret it later. 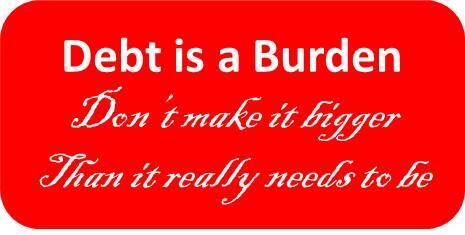 Debt is a burden. That of course is one opinion. What do you think? Your ideas and stories might help other people, so feel free to comment. If you found this article useful then please share it on social media with your friends.